The Muslim American community has become inextricably linked to the most controversial sports story of 2016. Protests similar to Kaepernick’s involving the U.S. flag and/or the national anthem have, deservedly or not, become commonly associated with Islam. But then about a day later, rumors began to surface that Kaepernick is in the process of converting to Islam and that his protest was perhaps influenced by his Muslim fiancee, MTV personality Nessa Diab. As I write this column, those rumors are still just rumors. While a refusal to stand for the anthem and salute the flag conveniently fits into every Islamophobic narrative that Muslims hate America, hate Americans and hate American freedom, it is not an entirely baseless association. After all, two of the most recent and most infamous incidents in which a high-profile athlete drew the ire of angry American “patriots” over the national anthem both involved Muslim NBA players. In 2014, Cleveland Cavaliers shooting guard Dion Waiters was quoted by a reporter that he had stayed in the locker room one night during the pregame playing of the anthem “because of my religion.” Until that moment, it was not known publicly that Waiters is Muslim. After a few days of social media outrage and a lot of hand-wringing at NBA headquarters, it was revealed that Waiters and the reporter had a miscommunication. Waiters (who now plays for the Miami Heat) was not actively refusing to stand for the anthem; he was just late coming out of the locker room because he was praying. The near-controversy quickly faded into a footnote. There was no such miscommunication in 1996, however, when Denver Nuggets point guard Mahmoud Abdul-Rauf began sitting out the pregame anthem. Abdul-Rauf, who was very public about his conversion to Islam, said that due to his religious beliefs he could not stand for the anthem and salute the flag. Social media wasn’t a thing back then, but hate mail and death threats were as real as ever, and Abdul-Rauf received plenty of both. The NBA suspended Abdul-Rauf for one game before he agreed to a compromise. He would stand for the anthem but he would pray during it. While short-lived, the controversy didn’t go away as easily. Abdul-Rauf’s NBA career seemed to go downhill from that moment, and while he ended up playing for many years overseas, to this day it is widely believed that Abdul-Rauf was blackballed by the NBA for his actions. How the Kaepernick story ends is yet to be seen. But it is clear that the Muslim American community is going along for the ride whether it wants to or not. Basketball Hall of Famer Kareem Abdul-Jabbar has written a column about Kaepernick and the complicated subject of patriotism. 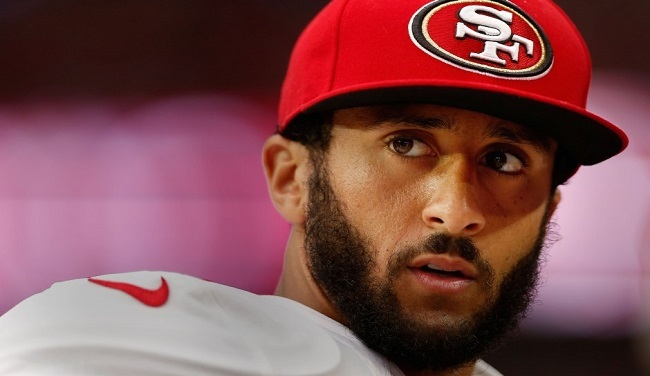 Nation of Islam leader Minister Louis Farrakhan has publicly pledged support for Kaepernick. And to no one’s surprise, the most famous Muslim individual in U.S. history has become posthumously linked to the Kaepernick story. That individual is Muhammad Ali. In today’s social and political climate, where athlete activism looks a lot different than it did during the Civil Rights Movement, some are already describing Kaepernick as a 2016 version of Ali — the three-time world heavyweight boxing champion who was not only known for taking controversial stances against American tradition, but also for shining a light on America’s ugly racist past and present. When Ali passed away earlier this year on June 3, many of the tributes that followed reminded us what it means for an influential individual to use their name and their fame for a greater cause. Less than three months after Ali’s death, another athlete has become public enemy No. 1 with a certain segment of society for taking a stance not unlike one Ali may have taken in his day. Another seemingly obvious truth that Kaepernick’s critics can’t seem to grasp is this: If their beloved “forefathers” of the U.S. possessed the same passivity and blind allegiance to authority that they want from men like Kaepernick, the American Revolution never would have happened. The country they know and love might still be essentially a British colony. America was built on the refusal of the oppressed to bow to their oppressors. Things just look a lot different when you used to be on one side but now find yourself on the other. The likely reality is that Kaepernick will land somewhere between Abdul-Rauf and Ali in the history pages of athlete activism. Because the NFL is such a massive media and marketing giant, anything its players do tends to garner more attention than the actions of athletes in other sports. An NFL quarterback taking a controversial political stance is going to have more impact than an NBA point guard doing the same. And because we are in the social media and the “hot take” journalism era, and because America is in such a volatile period politically and socially in regards to race, Kaepernick’s actions will ring louder than those of Abdul-Rauf. At the same time, Kaepernick is not going to be Ali. There will likely never be another Ali, who sacrificed his freedom to challenge the status quo at a time when he held status as the biggest sports superstar in the world. But Kaepernick doesn’t have to be Ali. By sitting down, Kaepernick is standing up for something more powerful than a song and heavier than a piece of cloth. It may cost him his job. It may cost him millions of dollars he could’ve earned in NFL salary and endorsements. It will most certainly cost him the peace of mind that comes with being the kind of assimilated, compliant and politically diplomatic figure many Americans would like their athletes — as well as minorities and other members of oppressed classes — to be. A lot of people can’t handle being confronted with harsh truths about that which they hold dear, whether it is their family or their values or their country. If one preseason game in Santa Clara marked the beginning of the end of Kaepernick’s NFL career, then it also marks the beginning of the most American thing he’s ever done on the stage that being an NFL player affords him. Because even if it takes place beyond the scope of glory, the truth is marching on. Say that Son !!! Great article !!! Lots of hypocrites, racists, fake patriots, and plastic people in this world.